I remember screening Waterworld the night before it opened when I worked at a movie theater in 1995. We were all waiting to see what $200 million, then the most ever spent on a single movie, looked like. I was the first to joke that the first thing we saw was Kevin Costner drinking his own filtered urine, but I liked the movie. It’s an action packed riff on Mad Max. Where else can you see water skiers pulled by a plane jump a ramp over a wall and make it? Arrow’s new Blu-Ray from a 4K transfer looks extraordinary. It’s way more clear than it was that night screening the print for the first time. The open ocean finds all kinds of shades of blue, and there’s tons of gritty detail in the surviving vessels and costumes. It’s hardly monochromatic as green and red rust is apparent on the rusted atoll and tanker metal. The sunburns are bright red. This is the first Blu-Ray release of the 3 hour TV cut to my knowledge. When it was released on DVD I enjoyed the epic length alternative. It feels like a Kevin Costner movie at three hours, although some of the ADR for network standards and practices compromise it. You’d think they’d make a PG-13 version of the extended cut. I still watch the long version when I feel like it (and have the time). “Maelstrom: The Odyssey Of Waterworld” is 102 minutes itself. If you’re looking for dirt, it’s downplayed (in some cases debunked) but they acknowledge it. 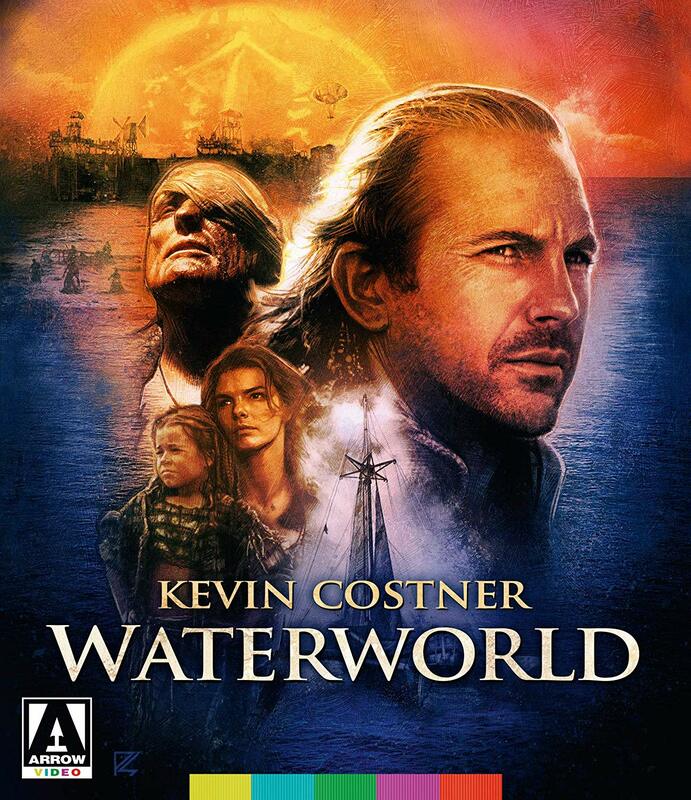 Perhaps this is the first time the craft of making Waterworld has been the focus in 24 years. Costner doesn’t give a new interview but his perspective has been well represented. Kevin Reynolds and producer Charles Gordon talk. Writer Peter Rader gives a lot of details omitted from his original script. Dennis Gassner and Dean Semler talk about a lot of the practical contraptions. EP Ilona Herzberg and other technical artists too. The stories of how they pulled off those stunts are even more exciting than the stunts on film! I’ve never heard Waterworld get credit for its pioneering digital water before either. I am surprised they don’t have Reynolds’ original cut, even if only in work print form. I guess they never saved it. “Global Warning” is more of a 22 minute feature with critic Glenn Kenny discussing the legacy of post-apocalyptic movies. He actually gave me some titles to add to my queue. He doesn’t talk about the obvious Mad Max films. These are all deep cuts.